I’m excited and very honoured to have my portrait of the wonderful ‘Silvana’ selected for inclusion in this year’s British Journal of Photography ‘Portrait of Britain’ nationwide exhibition! Described as an exhibition by the people, of the people and for the people, the 100 chosen images, out of almost 8000 entries, will be displayed on large JCDecaux digital screens in busy commuter hubs, railway stations, bus stops, airports, high streets and shopping centres across the country from the 1st – 30th September 2017. There are some incredible portraits (by some amazing photographers) selected this year so make sure you check out the full gallery here. I’ll be looking out for ‘Silvana’ on the big screens around London from next Monday but please send me a pic if you see her portrait on display in a town near you, thanks and enjoy the exhibition! Honoured to be exhibiting two of my portraits alongside some wonderful photographers such as Martin Parr, Dougie Wallace, Chris Steele Perkins, Jenny Lewis and many more for the first ‘Photography on a Postcard 2017 Exhibtion’ which has been organized by the Hepatitis C Trust’s fundraising arm ‘Art on a Postcard’. The exhibition will take place at London’s Printspace Gallery from the 13-17 of October. Admission is free and the public will be able to purchase a ticket guaranteeing them a photograph, although they won’t know which postcard they have won until the show closes on 17 October. Each photograph will be an edition of one and will come with a signed certificate of authenticity. A great exhibition and all for a great cause which I am very happy to be part of! For full exhibition details and the list of contributing photographers click here. Pretty chuffed to have my twins project ‘Alike But Not Alike’ featured in Esquire Russia this week. The feature includes 15 images from the project plus a small project synopsis. Because the feature is all in Russian I'm hoping it is complementary! If your Russian is up to scratch then check out the feature here. I am really excited to announce that I will be running another Street Portraiture Workshop at the National Portrait Gallery in London this summer! Last year’s workshop was a real success and I am, once again, really looking forward to sharing all of my tips and tricks of street portraiture with another group of photographers. The two-day workshop, open to photographers at all levels, will be a combination of discussions and practical assignments with plenty of opportunity to take portraits on the London streets. The workshop will be run on the 12/13 of August 2017 and will be limited to just 12 places. Advance workshop bookings for National Portrait Gallery members will start on the 1st of May followed by bookings for the general public on the 7th of May. Last year's workshop sold out fast so get in quick. More details and booking information from the National Portrait Gallery website. Great to pick up the latest issue of my favourite photography magazine 'Professional Photography' this morning to see that my ‘People of London’ book was chosen as one of the five books for review in the bookshelf section! Very complimentary review too, really pleased. Professional Photography Magazine is available from most newsagents in the UK or you can pick up a copy here. I’m thrilled that my ‘People of London’ book has been chosen by LFI (Leica Fotografie International) for this month’s ‘Book of the Month’! LFI is the leading Leica independent magazine which has been recognising great Leica photography for more than 60 years so this is a wonderful honour. You can check out the feature over at the LFI website. I recently undertook a wonderful commission for 'Popeye Magazine' which is Japan’s biggest selling mens fashion magazine (outselling both GQ and Esquire in Japan). The brief was to take portraits in London of men displaying sartorial elegance for a feature called ‘Gentlemen of London’. The editors chose to run a final nine portraits plus a small feature on me and my ‘People of London’ book. It is all in Japanese so I’m unable to read it but I am very happy with how the feature looks! You can buy Popeye Magazine here. Great start to the new year with this wonderful review of my 'People of London' book in the Januray/February issue of Australia's Vogue Living Magazine. You can purchase Vogue Living from selected stockists in the UK or you can download a digital copy of the magazine here. La Gens De Londres! Thrilled to have my ‘People of London’ book from Hoxton Mini Press featured in the new issue of Eurostar ‘Metropolitan Magazine’. Metropolitan Magazine is the award winning culture and lifestyle magazine available onboard the Eurostar. If you can’t pick up a copy onboard then you can download the magazine here. Really excited to invite everyone along to the long awaited ‘People of London’ book launch next week! The book launch will be a ‘double’ book launch with acclaimed street photographer Nick Turpin and his fantastic new book ‘On The Night Bus’. We will be celebrating the new ‘Tales From the City’ series from Hoxton Mini Press which includes both ‘People of London’ and ‘On The Night Bus’. The launch party will be Thursday the 17th of November from 6:30 - 8:30pm at Edgars Bar which is a wonderful venue in Broadway Market, Hackney. Signed books and collectors editions of both books will be available on the night. Come along, say hello, have a drink and celebrate the best in London urban photography! Pretty chuffed to be featured and interviewed in Huck Magazine this week discussing the influence of punk rock on my photography, drinking tea in Soho, life growing up in Detroit and of course my ‘People of London’ book from Hoxton Mini Press. If you can stomach it, then check out the interview at Huck Magazine. If you visited to the ‘Taylor Wessing Portrait Prize’ exhibition at the National Portrait Gallery last year, you may remember seeing my prize winning portrait of ‘Nyaueth’. Up until now, the print has never been available to the public but for a limited time only if you order one of the collector’s edition of my new book ‘People of London, from Hoxton Mini Press, included will be a hand signed and numbered print of Nyaueth. The ‘People of London’ collector’s edition really is beautiful sitting in its bright orange clam shelled, cloth covered and GF Smith lined box with gold foiled writing which is handmade in London. The signed print of Nyaueth is printed on gorgeous Hahnemuhle fine art paper and measures a generous 205mm x 144mm. The ‘People of London’ collector’s edition is strictly limited to 100 copies with prices rising as editions sell out so once they’re gone, they’re gone! Order your copy today at Hoxton Mini Press. I am very excited to announce the release of my first book ‘People of London’ published by the wonderful Hoxton Mini Press. The hardcover book is a collection of my 100 finest street portraits (alongside 50 intimate quotes) taken over a five year period in London celebrating the spirit and diversity of its people making London the greatest city in the world. The 160 page book is first in a new series from Hoxton Mini Press entitled ‘Tales from the City‘ dedicated to the best in urban photography from around the world. Additionally, ‘People of London’ is available in a beautiful ‘collectors edition’ which features a fully cloth-covered edition of the book presented in a bespoke cloth-covered clamshell box complete with a signed and numbered limited edition print. Pre-orders can now be placed at Hoxton Mini Press for both the standard and collectors editions. For full book details and to place your pre-order go to Hoxton Mini Press. 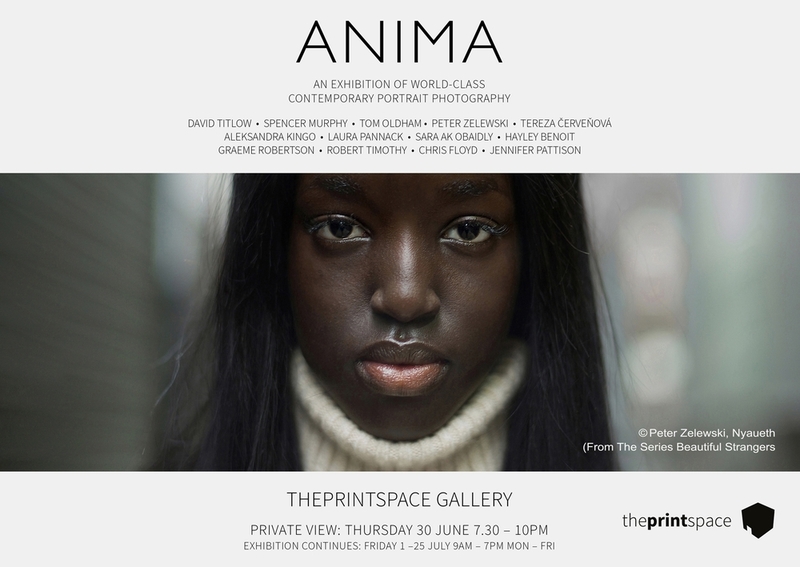 Really pleased to be part of the new ANIMA Exhibition taking place at the Printspace Gallery throughout July. ANIMA brings together winning and shortlisted images from the Taylor Wessing Photographic Portrait Prize and from several other highly prestigious international exhibitions and awards. The exhibition will also feature work from photographers such as David Titlo, Spencer Murphy, Tom Oldham , Tereza Cervenova, Aleksandra Kingo, Laura Pannack, Hayley Benoit, Graeme Robertson, Robert Timothy, Chris Floyd and Jennifer Pattison. There is a private view on Thursday 30th June (7.30pm – 10.00pm) with the exhibition continuing on Friday the 1st of July. Check out the Printspace for more details. I’m really excited to announce that I will be running a two-day Street Portraiture Workshop at the National Portrait Gallery in London this summer. The two-day workshop, designed to equip participants with the necessary skills for taking expert portraits on the street, will take place on the 23-24 July 2016. Running my own Street Portraiture Workshop has been something I have wanted to do a for a very long time and it is wonderful to be doing this with the National Portrait Gallery. The workshop is limited to just 12 places so make sure you are quick to reserve a spot. Bookings for NPG members has already started but I believe there are limited spots available for non NPG members which go on sale tomorrow morning. Full details can be found on the National Portrait Gallery website. Hope to see you at the workshop in July! I’m really pleased to be featured in the ‘Rising Stars’ section of this month’s ‘Professional Photography’ magazine. Recently, Professional Photography magazine has had a major re-design which has resulted in much improved layout, cleaner design and improved content. The latest issue features Martin Parr and Robert Mapplethorpe alongside my feature which includes images from my latest project ‘Beautiful Strangers’ plus an interview where I discuss my approach to street portraiture, my views on portraiture composition and why the Leica M rangefinder is the perfect tool for my work. Professional Photography is available in print throughout the UK or you can pick up single issues or a subscription here. Honoured to have been awarded third prize with my portrait of Nyaueth in this year’s Taylor Wessing Photographic Portrait Prize at the National Portrait Gallery awards ceremony on Tuesday night. Considering the sheer volume of entries this year (almost 5000 photographs from over 2000 photographers worldwide) I was overwhelmed just to have been selected for the exhibition, but receiving a 3rd place prize has really has been a dream come true. It was such a great feeling seeing my portrait on the gallery wall last week and also to meet with so many talented photographers at the awards ceremony, which again, showed the high level of work selected for this year’s exhibition. The exhibition is now open to the public and will be on display until the 21st of February 2016. For full details of the exhibition check out the National Portrait Gallery. Thrilled that the Guardian chose to run my Taylor Wessing portrait of 'Nyaueth' in their Eyewitness Series this week. The Eyewitness Series of photographs are chosen by the Guardian showing the world’s most distinctive and provocative photographs, providing a daily, visual reflection of global events. What a great suprise to open today's edition of the Guardian newspaper to see my Taylor Wessing shortlisted portrait of 'Nyaueth' in the center pages alongside the other excellent Taylor Wessing Prizewinning shortlisted images!